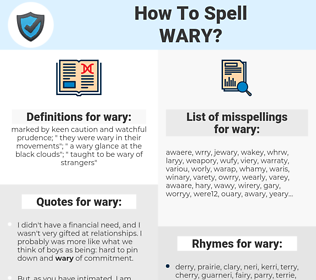 What are the misspellings for wary? What are the common mistypes for wary? What is the definition of wary? What are the quotes for wary? What are the rhymes for wary? What are the translations for wary? 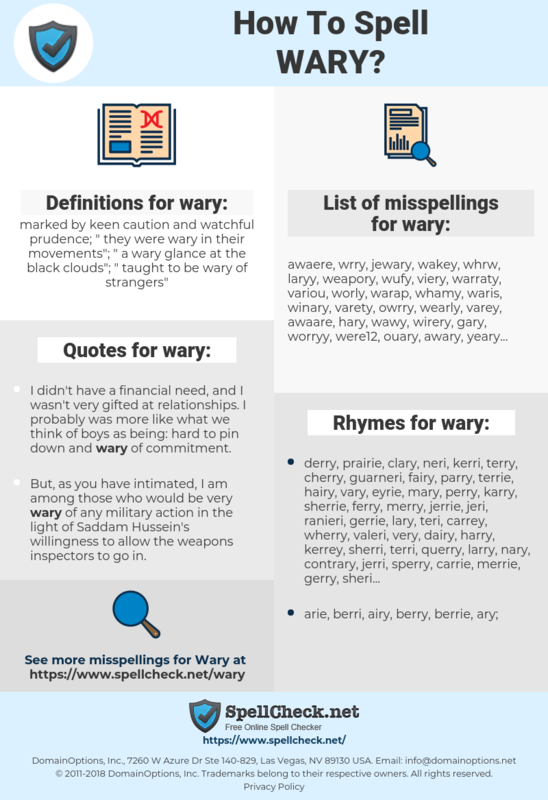 What are the common typos for wary? marked by keen caution and watchful prudence; "they were wary in their movements"; "a wary glance at the black clouds"; "taught to be wary of strangers"
This graph shows how "wary" have occurred between 1800 and 2008 in a corpus of English books. I didn't have a financial need, and I wasn't very gifted at relationships. I probably was more like what we think of boys as being: hard to pin down and wary of commitment. But, as you have intimated, I am among those who would be very wary of any military action in the light of Saddam Hussein's willingness to allow the weapons inspectors to go in. I'm very wary of news on television. It takes time to love someone properly, and in this business, you get very wary of people. prudent, méfiant, circonspect, sur ses gardes. wachsam, umsichtig, vorsichtig, behutsam, misstrauisch, achtsam, argwöhnisch, skeptisch. consciente, prudente, reacio, atento, cuidadoso, cauteloso, temeroso, precavido, recelosa, en guardia, receloso, desconfiado, reticente, reticentes, prudentes, cauto, aprensivo.